Will be the recipient of a THE NEXT FOOD NETWORK STAR prize package! All you need to do is add a comment to this post and tell me why you think you deserve the package (see below) more than some other Joe Shmoe. This contest will run from right now until midnight on June 2nd (this Monday). 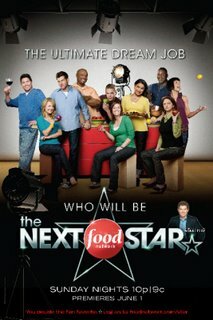 Season four of The Next Food Network Star premiers Sunday night (6/1) at 10pm.